November 15, 2013 bailout, banking, deficit, Dollar, Economy, FoxNewsChannel, Obama, Stimulus, stock market, Wall St.
Our magic president has appointed a new Fed chief to make more magic money. Janet Yellen’s Senate hearing for approval to succeed Ben Bernanke began yesterday. Andrew Huszar, a former bond buyer for the Fed, wrote an interesting apology in the WSJ this week for his role in “quantitative easing”. He says that the Fed never bought a mortgage bond in its 100 year history until he was hired in 2009 to buy $1.25 trillion of the things! In a single year. 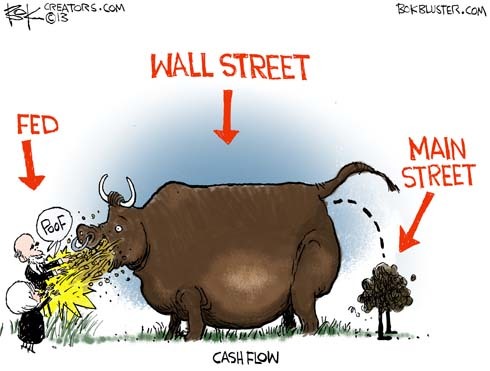 According to Huszar Bernanke spun the scheme as a plan to help Main Street but it was really “the biggest backdoor Wall Street bailout of all time”. Chairman Ben Bernanke made clear that the Fed’s central motivation was to “affect credit conditions for households and businesses”: to drive down the cost of credit so that more Americans hurting from the tanking economy could use it to weather the downturn. QE may have been driving down the wholesale cost for banks to make loans, but Wall Street was pocketing most of the extra cash.